In the last article I told you that McDonald's used three main ingredients to become one of the most successful and profitable companies in the world. If you missed the first ingredient to success article – click here to catch up. In today’s article, we’ll go into more detail about the second ingredient to their success. Click on the link to learn more about my incredibly simple plug and play investment strategy. Even though there are over 35,000 restaurants worldwide, no matter which McDonald’s you sit at, you can be guaranteed a consistent experience. Whether it’s the wrapper on the burger, the McFlurry’s spoon to the taste and look of the chips and Big Mac – you know what to expect when you go to McDonald’s. 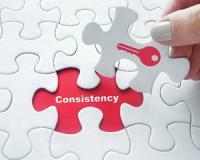 Consistency is not only important for a customer’s experience but also for the sales of the business. Ray Kroc understood that every burger was made with precise ingredients. If anything changed, this would cause a drop in sales. But more importantly, he wasn’t just selling a burger but a winning turn-key system. In fact, McDonald’s has a process for every part of their business. Each and every item on the menu shows a process on how it’s made, even how the chips are salted. 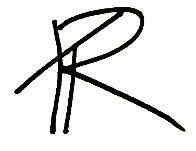 Consistency outlines exactly a standard that needs to be met and followed. Even Hamburger University systematically teaches future franchisees how to run a McDonald’s restaurant the way Ray Kroc envisioned. With trading, it’s pretty much identical. When you have a winning trading strategy, the key to profits lies in consistency. Every market you analyse needs to have the exact same chart layout. With Red Hot Storm Trader, I follow three consistent chart layouts. With every trading strategy you follow, you’ll need to watch a number of markets. This is known as a watch list. Over 10 years ago, I spent countless hours and sleepless nights, going through every market I could think of. Indices, currencies, stocks and commodities. Over time, I cut out markets that yielded more losing trades than winners. And at the end, I found that the strategy I had worked best with the JSE top 40 companies. Today, I consistently analyse these 40 stocks on a daily basis. When you open a chart, each bar tells you the buying and selling that took place over a certain time period. This is known as the time frame. You can choose many different time frames from tick, 5 minutes, hourly, daily, weekly up to monthly. The time frame you choose depends on the number of trades you wish to take in a week. The short time frames like 5 minutes up to 10 minutes – You can expect to take up to five trades per day. This can be stressful if you don’t have the time and effort to watch the market all day. 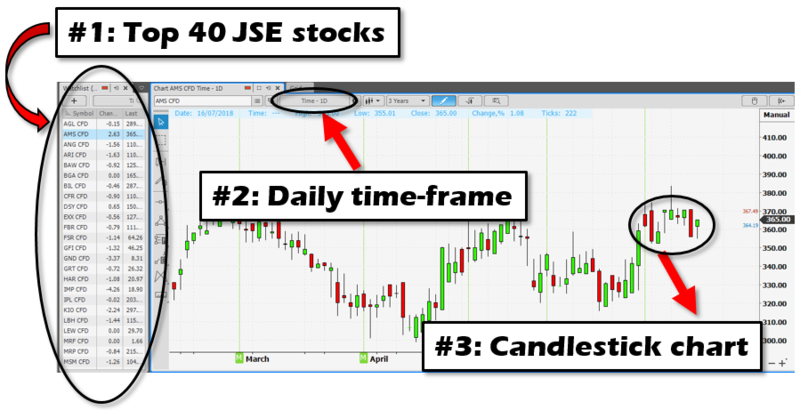 Instead, I use a daily time frame for the JSE Top 40 Stocks. I’ve used this time frame for over 15 years and year after year it has proven to yield profitable results. And best of all, I’ll only take around one trade per week. This means, I’ll have time to run businesses and have time for my family. Publisher’s Pick: ‘Three Triple Digit profit Plays in 2018’ In the past 8 years a select few South Africans grew their investment portfolio five-fold! Now it could be your turn. There’s a wealth of incredible, potential-packed stocks hidden in the JSE. Now we want to give you the chance to get in on the next round. The market is packed with massive possibilities in a bunch of sectors. When you open a chart, you’ll see a bunch of information telling you about the market activity that took place. I’ve found that the Candlestick chart reveals the most important information I need to trade the markets. A Candlestick chart is a charting type you can find on any trading platform these days. The more consistency you have with the chart layout the easier it will be to follow, analyse and monitor your trading strategy. PS: If you would like to adopt a profitable and consistent system I’ve used over the last 15 years, click here to join my most elite group of traders.